Peel and chop potatoes and boil in salted water unitl soft. 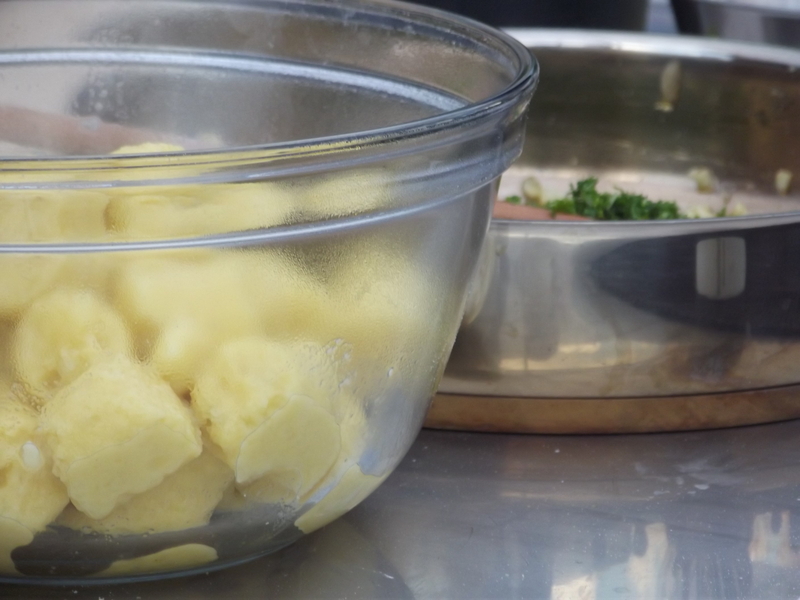 Drain, then add butter, mash or place through a ricer or mouli for a lump-free mixture and leave to cool. Add flour and whisked eggs and mix to form a dough. On a clean bench, knead until smooth and soft. Roll doughly into small, skinny cigar shages, then cut into 1.5cm-thick slices. Dust gnocchi with flour as you work so it doesn’t stick to bench. Poach gently in boiling salted water for 2 minutes, or until they rise to the surface. then remove with a slotted spoon to serving plates garnished with watercress. Sweat off shallots and garlic in some of the olive oil. When softened, set aside to cool. Toss through lemon juice, preserved lemons, herbs and remaining extra virgin olive oil. Serve warm gnocchi with salsa spooned over the top. Now that definitely looks like something new to try in the kitchen – Give it a whirl, and let me know how you go – anyone brave enough to send us a picture of their own attempt, perhaps? We are heading off to Dunedin today, getting prepared for the Otago Farmers’ Market Cook-off – if you are in the area, make sure to stop by, check out the action and say hi! 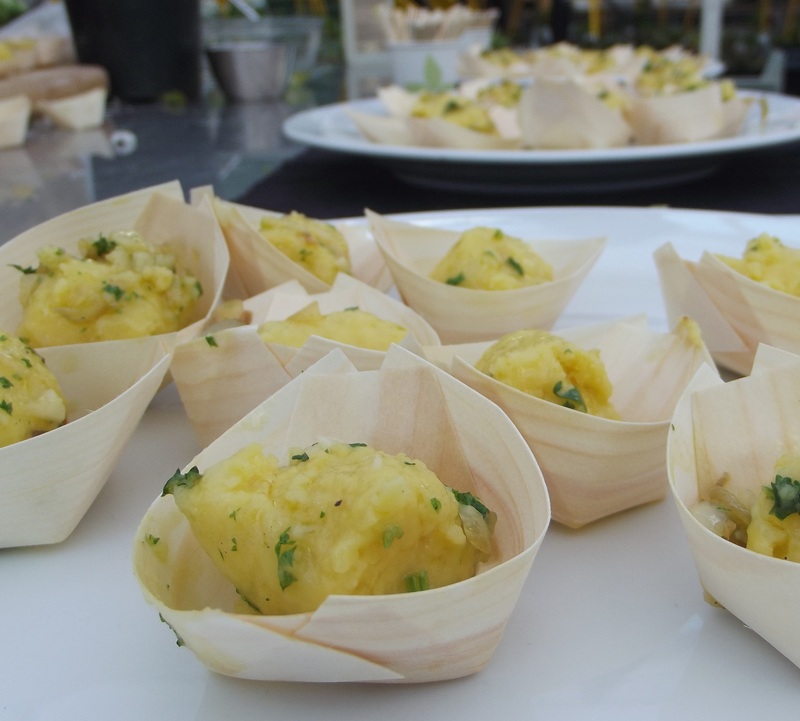 We kicked things off in style on Sunday at Marlborough Farmers’ Market, and talk about delicous! 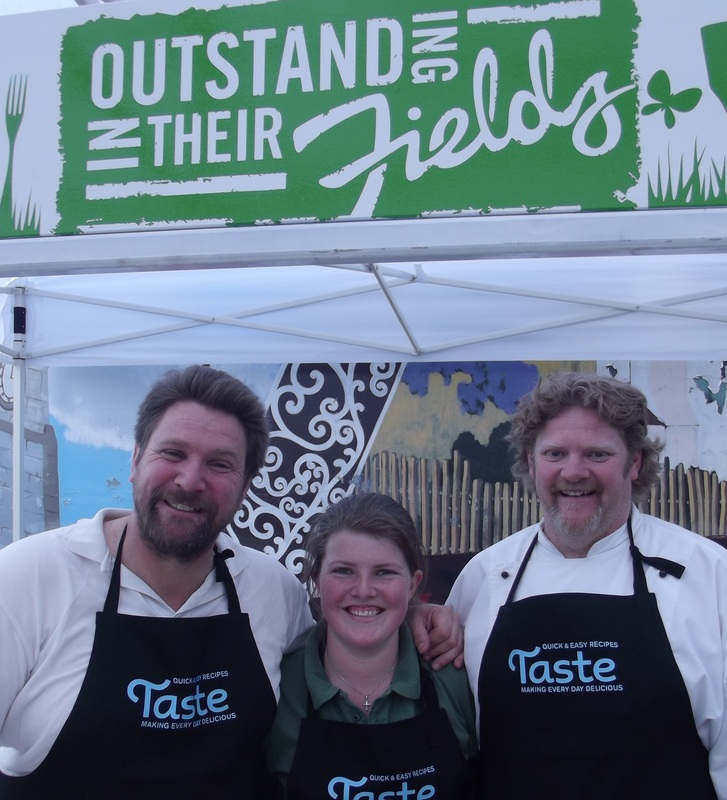 Marcel Rood, Matt Allan and Chris Fortune each whipped up a seasonal Farmers’ Market spectacular. 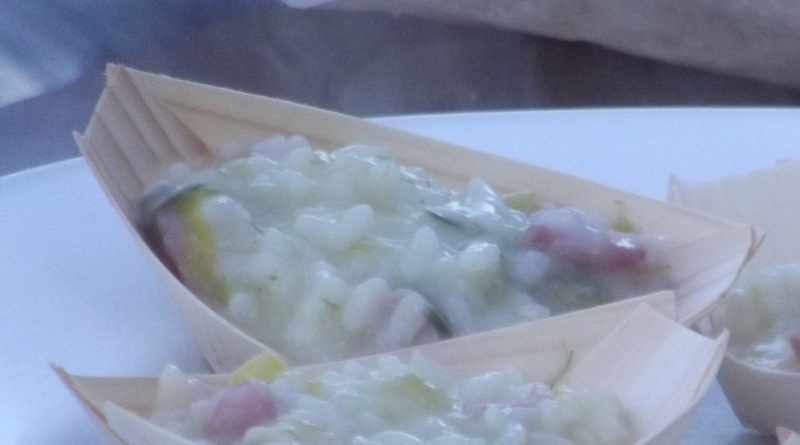 Matts’ Bacon and Leek Risotto is definitely a recipe I am going to have to try out myself – sweet Marlborough Leeks, salty bacon… heaven on a plate! Really simple, fresh seasonal ingredients and absolutely packed full of flavour. Matt makes his own stock, which probably explains why it was out of this world, but it can just as easily be made with the boxed version. And here’s the recipe for you all; I can imagine everyone who was lucky enough to have had a taste is going to want to try this one at home. Keep the stock hot in a saucepan. Heat the oil in another large pan and fry the bacon until crisp. Remove from the pan with a slotted spoon and set aside. Stir in the leeks and soften for 5-7 mins. Add the rice and cook for 1 min. Pour in the wine and keep stirring until it is absorbed. Add the stock, one ladle at a time, stirring and waiting for the rice to absorb the liquid before adding more. Continue for about 20 mins until the rice is just cooked and the risotto has a creamy consistency. Season, then stir through the bacon along with most of the cheese, saving some for topping the dish just before serving. Also, check out Marlborough Farmers’ Market in action: its a great place to visit if your ever in the region, super friendly people and delicious food! I will be back tomorrow with Chris Fortunes’ Potato Gnocchi recipe – see you all then!